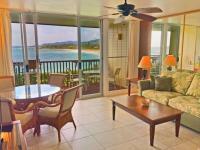 Our Wailua vacation rentals enjoy close access to great beaches and hiking trails as well as shopping and dining. Basking in the tropical tradewinds of Kauai's scenic eastern shore, Wailua is the ideal place for the Hawaii vacation you have always dreamed about. Wailua offers an assortment of things to see and do from waterfalls and beaches to ziplining and horseback riding. Kayak up the Wailua River or have a picnic at the beach. If you like waterfalls make sure to drive to the Lookout points to see the thundering Opaekaa Falls which makes a 151-foot drop, and the majestic 80-foot Wailua Falls which is renowned worldwide for its role in the opening credits of the Fantasy Island TV series. Check out the Fern Grotto Tour on the Wailua River for a two-mile upriver journey including live music and a hula lesson on a large river cruise boat. When the boat lands upriver guest enjoy a short nature walk to the Fern Grotto, a natural lava rock amphitheater-like cave draped with ferns. The musical entertainment will help you appreciate the Fern Grotto's acoustics. Golfers will enjoy the municipal Wailua Golf Course which has been rated as one of the top public courses in the US. Stretching along the scenic Wailua shoreline, the 6,981 course offers ocean and mountain views and challenging play. The commercial district along the main highway passing through Wailua and Kapaa spans a few miles and includes a bevy of restaurants offering just about any type of cuisine you desire. There are also numerous fast-food outlets, two large grocery stores, and a diverse assortment of boutique shops and art galleries. Drive south to Lihue for more shopping and dining choices including large discount stores. Heading north from Wailua you can find upscale boutique shops and nice restaurants in Kilauea town as well as Princeville Resort and Hanalei town.